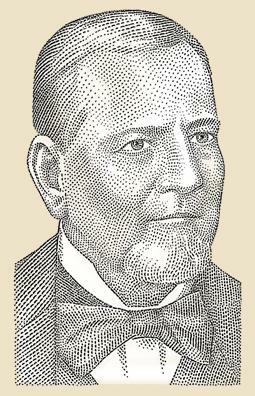 Born in 1825, William Larue Weller was one of the early whiskey pioneers in Kentucky. After serving with the Louisville Brigade in the 1840's, Weller returned to Louisville to open his wholesale liquor business. Weller developed his original bourbon recipe with wheat, rather than rye in the mash bill. Wheat is a soft grain providing his bourbon with a mild, gentle and smooth taste. Weller is reported to have used the slogan "Honest Whiskey at an Honest Price." He spent his lifetime educating consumers about the differences in his bourbon. William Larue Weller's wheated bourbon became so popular, that Weller was forced to put a green thumbprint on barrels to ensure that customers were receiving the real deal. Pappy Van Winkle eventually merged Weller's namesake company with the A. Ph. Stitzel Distillery to form the Stitzel-Weller Distillery.